The written word is dying. I don’t know when it will die, but the day is rapidly growing closer. As a writer I decry this fact often in this blog, but as a scientist (at heart, if not by training) I recognize it as inevitable and not an inherently bad thing. First, let’s examine the evidence for it. Go online anywhere, e.g. Facebook, Nextdoor, etc., and see how people write. In a word: badly. In two words: very badly. In third world countries where illiteracy has always been high, even poor people have cell phones. They can communicate with others without ever having to learn to read or write. They’ve skipped the written stage and are none the worse for it. Technological advances like Siri, Alexa, and Google Assistant have become very popular and very good. It is now possible for me to talk to my phone and get a good answer or action. Now that I have arthritis in my hands, I should probably use it more, but I am so used to being on my keyboard, I haven’t really gotten on board with that. People in the first world are more and more likely to communicate by posting photos or videos. People read fewer books than ever before, at least printed books. Audiobooks are increasingly popular and, of course, video media such as broadcast television, discs, and streaming are the standard form of entertainment now. Newspapers are dying. It’s easy to blame technology for this, and indeed it is the main driver of the trend. But the word blame carries a negative judgment that I think is undeserved. Take a look at human history. Man in his modern form, homo sapiens, evolved around 100,000 years ago. Although it is hotly disputed when spoken language evolved, or even what constitutes language among primates, most scholars seem to think it reasonable to say that by the time homo sapiens arrived on the scene, so did spoken language. So we’ve been talking for 100,000 years. We evolved with the ability to speak and understand others’ speech, and those abilities evolved with us. On the other hand, written language first appeared about 5,000 years ago. In other words, for 95% of human existence, especially the time period when man evolved into a modern “civilized” creature, he only needed to be able to speak and understand speech. Even before that, man’s predecessors had learned to make and understand sounds to communicate various things such as warnings of predators, or even joy. The written word was a great invention that allowed for permanence and consistency, but wasn’t used by most humans until very recently. The prevalence of dyslexia and the well-established fact that many or most students learn better from oral instruction than from reading are evidence that man really hasn’t evolved as a reading being, but as a speaking being. Now that technology is making it possible, I believe the written word will fade into antiquity much like the abacus, slide rule, and chiseling on stone tablets. It will always exist in some form, of course, but will be a subject for historians and archaeologists the way Latin and cuneiform are today. Perhaps I shouldn’t be so picky about bad spelling and grammar. I believe written language is unnatural from an evolutionary standpoint, but bad grammar in spoken language is still bad. It leads to misunderstanding and to being relegated to a lower class. Learning to write well, and to be able to read difficult material, is still important to be able to lead a full and rewarding life. This entry was posted in Uncategorized on February 23, 2019 by Russ. This entry was posted in Uncategorized on February 16, 2019 by Russ. Our country’s checks and balances are based primarily on the independence of the three branches of government: executive (President), legislative (Congress) and judicial (Supreme Court). The separation of federal and state government is another way, but that’s not my focus. I got to wondering how representative the U.S. Supreme Court is of the country as a whole. The responsibility of interpreting the U.S. Constitution and statues involves value judgments: how much process is “due”; what legislation is “appropriate?” These and many other words in the Constitution are very subjective. The numbers show how many justices grew up or were educated in those states. There were a total of 56 researched. Some justices moved throughout their youth, but I did my best to identify the state for which they would considered a “native son” or “native daughter,” usually where they lived during middle and high school years which I consider formative. 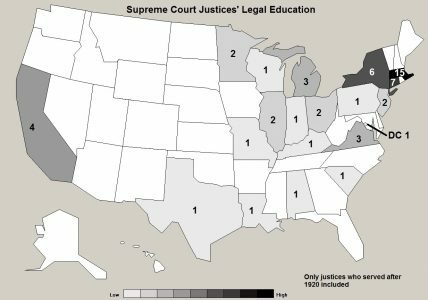 The second map generally shows where they attended law school, but many justices in the earliest part of the range never graduated from law school and may not ever have attended law school. “Reading the law” with a law firm or judge and then taking the bar was a common method of obtaining a legal education up until the 1960s or so. 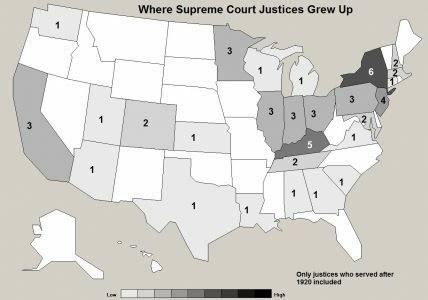 The maps do not necessarily reflect where the justices practiced law, which did include some states not shown as represented (such as Wyoming). The northeast is heavily represented, some may say over-represented, especially in the second map. Almost all of the those educated in Massachusetts, Connecticut, New York, or New Jersey were from Ivy League law schools (Harvard, Yale, Columbia, and Princeton respectively). The Midwest gets some fairly decent representation at least on the top map, but the Deep South and West seem to be short-changed. Some very populous states, such as Florida and North Carolina, have not had a justice appointed in the last 100 years, and Texas has had only one. This trend toward the Ivy League has gotten stronger in recent years, which seems surprising considering the push for diversity in other parts of government. The last justice to serve who didn’t attend an Ivy League law school was Sandra Day O’Connor (appointed in 1981). Kentucky surprised me, but it was probably an important swing state between the north and south in the early 20th century and I suspect politics played a part in those appointments. The most recent Kentuckyan to serve was Chief Justice Fred Vinson (1937 – 1943). Many of the justices were politicians before their appointments and quite a few came from very modest circumstances, although most were from relatively prosperous, well-educated families. This entry was posted in Uncategorized on February 13, 2019 by Russ. I’m taking a Python class at the local Adult Ed. 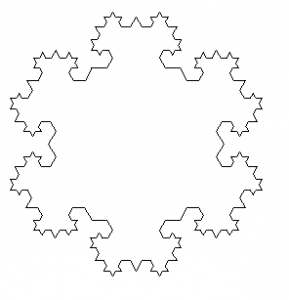 They just had us code a fractal snowflake to teach us recursion. It’s kinda fun, I suppose. This entry was posted in Uncategorized on February 11, 2019 by Russ. 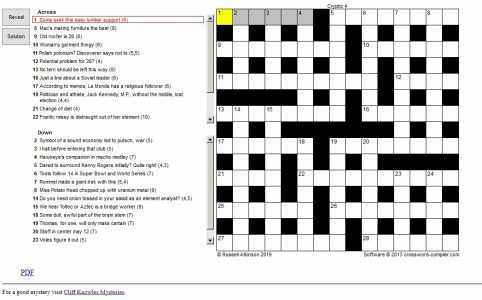 I just uploaded a new cryptic crossword. To play, click on the link, not the picture. This entry was posted in Uncategorized on February 2, 2019 by Russ.